Vessel documentation is a national form of registration. It is one of the oldest functions of Government, dating back to the 11th Act of the First Congress. Documentation provides conclusive evidence of nationality for international purposes, provides for unhindered commerce between the states, and admits vessels to certain restricted trades, such as coastwise trade and the fisheries. Since 1920, vessel financing has been enhanced through the availability of preferred mortgages on documented vessels. WHAT VESSELS MAY BE DOCUMENTED? A vessel must measure at least five net tons and, with the exception of certain oil spill response vessels, and must be wholly owned by a citizen of the U.S.
MUST MY VESSEL BE DOCUMENTED? Vessels of five net tons or more used in fishing activities on navigable waters of the U.S. or in the Exclusive Economic Zone (EEZ), or used in coastwise trade must be documented unless the vessel is exempt from documentation. Coastwise trade is generally defined as the transportation of merchandise or passengers between points in the U.S. or the EEZ. In addition, towboats operating between points in the U.S. or the EEZ or between the EEZ and points in the U.S. and dredges operating in the U.S. or the EEZ must be documented. HOW DO I KNOW IF MY VESSEL MEASURES FIVE NET TONS? Net tonnage is a measure of a vessel’s volume. It should not be confused with the vessel’s weight, which may also be expressed in tons. Most vessels more than 25 feet in length will measure five net tons or more. For information about how tonnage is determined, visit with an AVDA member who will gladly help you with determining if your vessel is eligible. Vessels that do not operate on the navigable waters of the U.S. or in the fisheries in the EEZ, are exempt from the requirement to be documented. Also exempt are Coastwise qualified, non-self-propelled vessels used in coastwise trade within a harbor, on the rivers or lakes (except the Great Lakes) of the U.S. or the internal waters or canal of any state. ARE THERE DIFFERENT TYPES OF DOCUMENTATION? Yes. A Certificate of Documentation may be endorsed for fishery, coastwise, registry, or recreation. Any documented vessel may be used for recreational purposes, regardless of its endorsement, but a vessel documented with a recreational endorsement only may not be used for any other purpose. Registry endorsements are generally used for foreign trade. WHAT ARE THE REQUIREMENTS FOR DOCUMENTATION? The basic requirements for documentation are to demonstrate ownership of the vessel, U.S. citizenship, and eligibility for the endorsement sought. HOW IS VESSEL OWNERSHIP ESTABLISHED? If the vessel is new and has never been documented, ownership may be established by submission of build evidence, naming the applicant for documentation as the person for whom the vessel was built or to whom the vessel was first transferred. Also acceptable is a transfer on a copy of the State Registration or Title, or foreign registration showing that the applicant owns the vessel. In the case of a previously owned vessel, the applicant must present bills of sale, other evidence showing transfer of the vessel from the person who last documented, titled, or registered the vessel, or to whom the vessel was transferred on a Builder’s Certification or Manufacturer’s Certificate of Origin. Please contact an AVDA member for help in determining what documents will be required for ownership transfer. HOW DO I ESTABLISH U.S. CITIZENSHIP? Citizenship is established by completion of the Application. In addition to individuals, corporations, partnerships, and other entities capable of holding legal title may be deemed citizens for documentation purposes. Corporations must be registered in a state or the U.S; the chief executive officer and chairman of the board of directors must be U.S. citizens, and no more than a minority of the number of directors necessary to constitute a quorum may be non-citizens. In addition, at least 75% of the stock must be vested in U.S. citizens for a coastwise or fisheries endorsement. WHY AND HOW IS BUILD EVIDENCE ESTABLISHED? Evidence that a vessel was built in the U.S. is required for a vessel, which is to be used in the fisheries or coastwise trade. Build evidence is normally established the person who constructed or oversaw the construction of the vessel or an official of the company that built the vessel who has examined the records of the company to determine the facts of build. WHAT ARE THE VESSEL NAME AND HAILING PORT MARKING REQUIREMENTS? Documented vessels do not display their official numbers on the outside of the hull, but are identified by the name and hailing port. The application for documentation must include a name for the vessel composed of letters of the Latin alphabet or Arabic or Roman numerals and may not exceed 33 characters. The name may not be identical, actually or phonetically, to any word or words used to solicit assistance at sea; may not contain or be phonetically identical to obscene, indecent, or profane language, or to racial or ethnic epithets. Once established, a vessel’s name may not be changed without application, fees, and the consent of the Director, National Vessel Documentation Center. There is no rule against duplication of names for documented vessels; so hailing ports are helpful in identifying vessels. HOW DO I MARK MY VESSEL? The official number assigned to documented vessels, preceded of the abbreviation “NO.” must be marked in block-type Arabic numerals at least three inches high on some clearly visible interior structural part of the hull. The number must be permanently affixed so that alteration, removal, or replacement would be obvious and cause some scarring or damage to the surrounding hull area. The name and hailing port of a recreational vessel must be marked together on some clearly visible exterior part of the hull. The vessel name of a commercial vessel must also be marked on the port and starboard bow and the vessel name and the hailing port must be marked on the stern. All markings may be made by any means and materials that result in durable markings and must be at least four inches in height, made in clearly legible letters of the Latin alphabet or Arabic or Roman numerals. The “hailing port” must include a place and a State, Territory, or possession of in the United States. The state may be abbreviated. HOW DO I CHANGE THE NAME OR HAILING PORT OF MY VESSEL? Contact an AVDA member to help with changing the Name or Hailing Port of your vessel. An AVDA member will also help if your vessel is subject to a mortgage of record, you must obtain permission from the mortgagee, which is required. WHY DOES THE COAST GUARD REQUIRE DESIGNATION OF A MANAGING OWNER? Many vessels have more than one owner. To make sure that the right person gets mail concerning the vessel, one must be designated as the managing owner. WHAT IS A PREFERRED MORTGAGE? A preferred mortgage is a mortgage which is given status as a maritime lien. As such, it enjoys a certain priority in the event of default. In addition, the Coast Guard is prohibited from making certain changes in documentation including, but not limited to, change of vessel ownership, name, and hailing port without consent of the mortgagee. For this reason many financial institutions require vessels which are eligible for documentation to be documented and to have preferred mortgages recorded against them. HOW DO I OBTAIN TITLE INFORMATION FOR A DOCUMENTED VESSEL? Contact an AVDA member to help you obtain an Abstract of Title which will show all bills of sale, mortgages, and notices of claim of lien filed and recorded by the Coast Guard. Please have ready the vessel’s USCG Official number and Vessel Name to ensure accurate information on the correct vessel. IS A DOCUMENTED VESSEL EXEMPT FROM STATE JURISDICTION? No, all documented vessels must comply with the laws of the state in which they are operated. The vessel’s document must be shown to state law enforcement personnel upon their demand. States may require documented vessels to be registered (but not numbered) and to display state decals showing that they have complied with state requirements. IS THE VESSEL TENDER DOCUMENTED? WHAT HAPPENS WHEN I SELL MY DOCUMENTED VESSEL? When the sale is finalized, an AVDA member will help you with the necessary instruments required to transfer the vessel to the new owner. Documentation forms, fees schedules, and instructions are available by contacting an AVDA member. If there is an outstanding mortgage, the mortgagee (lender) should complete a Satisfaction of Mortgage and mail an original and one copy to the National Vessel Documentation Center. The vessel cannot be removed from documentation with an outstanding mortgage. Again, these are issues that an AVDA member is prepared to help obtain all required documents for a smooth transfer. HOW LONG IS THE CERTIFICATE OF DOCUMENTATION GOOD? A Certificate of Documentation is valid for one year from the date of issue, providing there are NO CHANGES other than a change of owner’s address. The Certificate must be renewed on an annual basis. Even though it is up to the owner to assure the document does not expire, the Coast Guard will send a Notice of Renewal to the managing owner approximately 45 days prior to expiration. There is no fee for the yearly renewal. See the instruction letter Renewal of Certificate of Documentation elsewhere at this site regarding renewal procedures. MAY I RENEW A LOST CERTIFICATE OF DOCUMENTATION? NO. A new application must be filed along with the applicable fees. If the lost document has already expired it must be exchanged. Your AVDA contact will help determine if the document is lost, or Re-issue is required. SHOULD I RETURN THE CERTIFICATE OF DOCUMENTATION WITH THE RENEWAL NOTICE? NO, simply sign date and return the Renewal Notice…even if your address has changed. Please note the address change. You will receive a new certificate that shows your new address. MAY I RENEW MY DOCUMENT EARLY? YES. Contact an AVDA member for more information. MAY I RENEW THE CERTIFICATE AFTER THE OWNERSHIP CHANGES? NO. Additional documents are required for ownership transfer. Please call an AVDA member to help with this transaction. HOW DO I DELETE A VESSEL FROM DOCUMENTATION? A vessel may be deleted from documentation upon the request of the vessel owner or an authorized agent on behalf of the owner. The request must be in writing and is to include the vessel’s official number. The original Certificate of Documentation (COD) is to be returned by the owner named on the certificate. An AVDA member will gladly help with these details. HOW DO I GET A COASTWISE WAIVER FOR A SMALL PASSENGER VESSEL? The Maritime Administration grants small passenger vessel waivers for operation in the coastwise trade. You should contact the agency at (202) 366-PORT (7678). 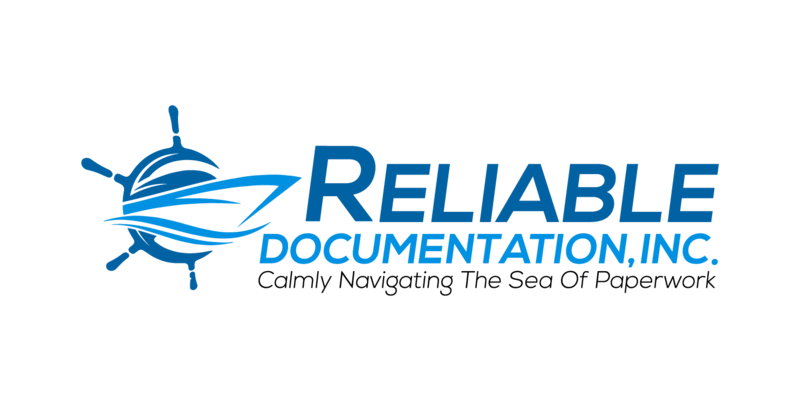 © 2017 Reliable Documentation, Inc. All Rights Reserved.